Forget the board room. Women’s voices are barely even present on conference calls. Corporate America’s most important publicly-conducted discussions -- the quarterly earnings calls held by almost all listed companies -- are dominated by men, who talk more often and speak longer than women, according to research done at Bloomberg’s request by Prattle, a company that provides automated research by parsing central bank and corporate communications. In a study of more than 155,000 company conference calls over the past 19 years, Prattle found that men spoke 92 per cent of the time. That’s partly because male executives and analysts far outnumber women in those roles. It’s also because men just talk more. Academic research suggests she’s right. When women participate more in group discussions, the conversation goes in different directions compared with discussions where men dominate, according to Chris Karpowitz, an associate professor of political science at Brigham Young University. Separate research done by Alok Kumar found that female analysts issue bolder and more accurate forecasts, and that stock market participants are aware of the skill differences between men and women. 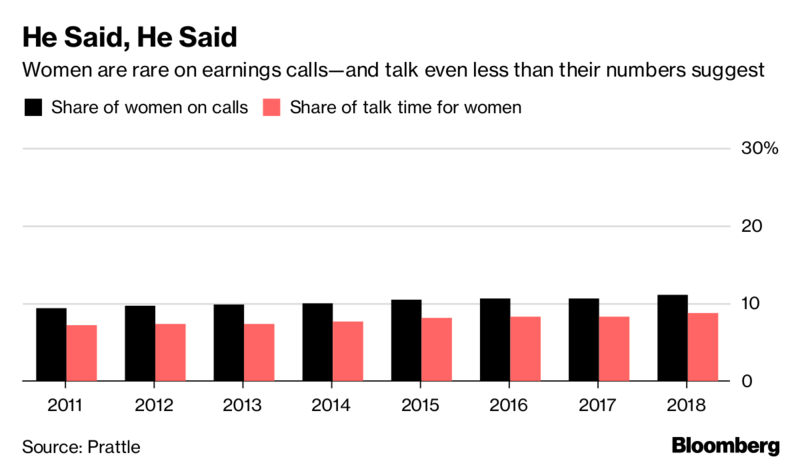 The eight per cent of the time women speak on earnings calls includes boilerplate introductory remarks delivered by investor relations executives. Women make up nearly one quarter of the investor relations people on earnings calls, the area in which they have progressed the most, according to Prattle’s analysis. "This is both great progress and a sad statement about appropriate gender representation among female executives and analysts," Schnidman said. The difference in gender representation in certain sectors is "staggering," Schnidman said. "Women make up just 7.5 per cent of personnel on energy sector earnings calls, whereas they make up nearly 19 per cent of personnel on retail sector earnings calls." Even where women are most present, it may not be enough to reap the benefits of a diverse group. Studies have found that men talk more than women in all kinds of group settings, including school board meetings and the Supreme Court. If women make up 20 per cent of a group they make up 10 per cent of the conversation, Brigham Young’s Karpowitz found. That means women don’t overcome the talk-time deficit until they make up a super-majority in a group. And on conference calls, “there aren’t many women analysts” at all, Bloomberg Intelligence senior U.S. banks analyst Alison Williams said. According to Bloomberg data, among the 32 analysts covering Bank of America Corp., three are women; among 45 covering Apple Inc., also three women. And among the 24 analysts covering Exxon Mobil Corp.? Zero women. An average earnings call has about 14 people contributing, Prattle’s analysis shows. Of those, three are male corporate representatives, while one corporate representative is female. About six male analysts speak, while two female analysts make remarks. Prattle’s program couldn’t identify the gender of, on average, one corporate representative and one analyst on each call. Among the corporate representatives, men typically outrank women. More than 45 per cent of male speakers are CEOs, compared to 17 per cent that are women. Twenty-eight per cent of male company representatives on calls are CFOs, versus 25 per cent of women. More than half -- 54 per cent -- of female speakers during calls are non-C suite employees, versus just 20 per cent of male corporate representatives. When women do speak -- there are, in fact, calls in which women either aren’t present or do not participate -- they do so an average of 4.5 times per call, compared with 6.1 times for men. The data show the "number of women on calls is rising over time and so is the per cent of language attributed to women," Schnidman said. "But neither is rising very quickly."